I visited the Connecticut State Library for the first time this week. 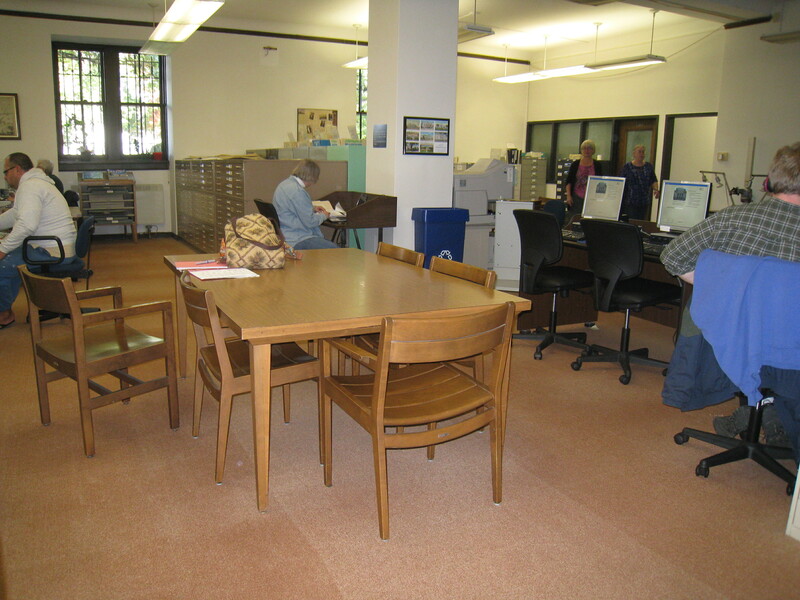 The library, located in downtown Hartford on Capital Avenue, has a genealogy/history section on the lower level. I parked in the parking garage just across Oak Street. Examining the resources in advance, I consulted the Genealogists page (note that the collections extend for several pages). 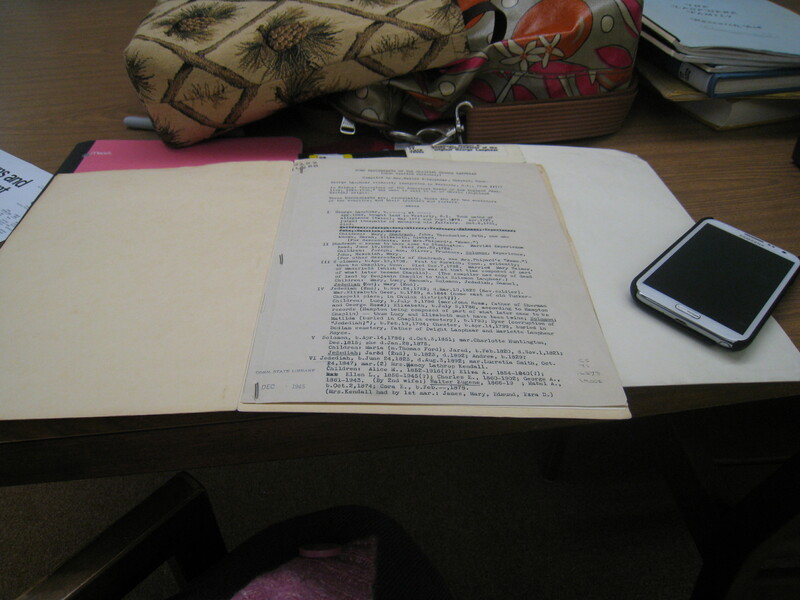 There is a page of finding aids for historical collections, some of which are online. 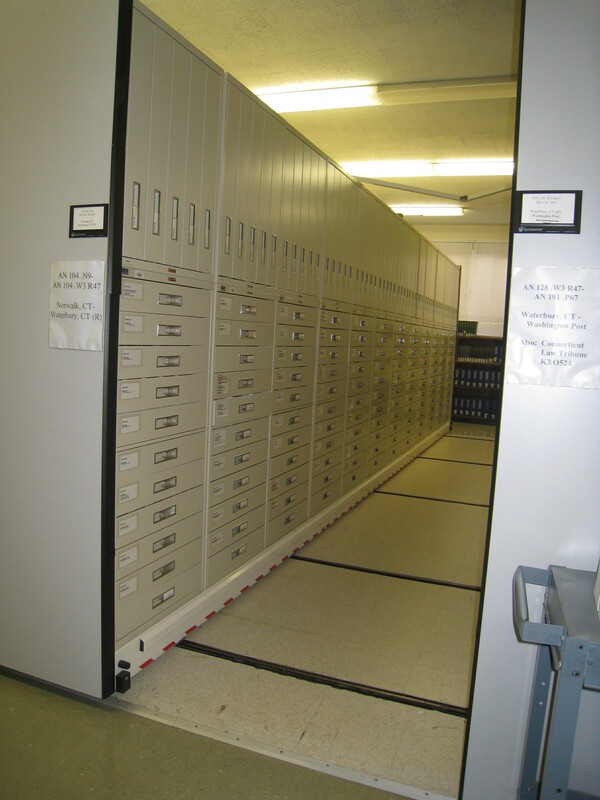 There is a collection of digital records at the Connecticut State Library which can be searched online, and a search screen for “Databases of Individuals Listed in State Archives Records“. My mission that day was to look for a death record for my gggg-grandmother Sarah Andrews, who died probably shortly after 1861, when she appeared in the Norwich City Directory boarding in the same house as her (I believe) son Benjamin Andrews. She would have been around 85 at that point. I had been to Norwich, and also Eastford and Ashford, and had not found a record yet. I was hoping to find a maiden name. 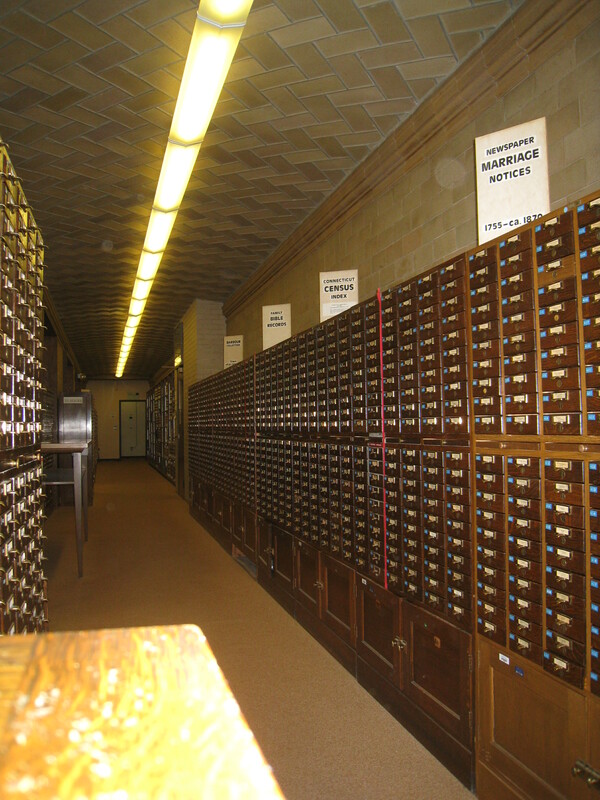 There is a long hallway to one side of the reading room that contains many of the well-known Connecticut card indices. You get to visit them in person! 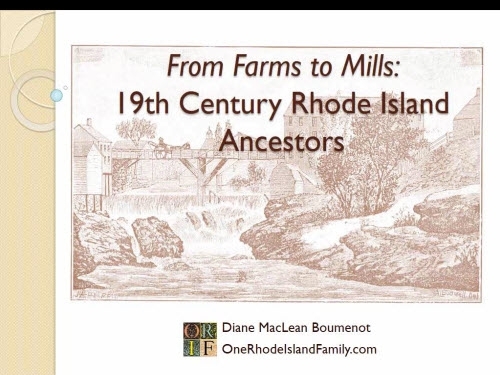 I do not have a lot of Connecticut ancestors, and certainly no early Connecticut families before 1800. If I did, I would really have been at the right place. For those who have those connections, I would say this library is a must-visit. 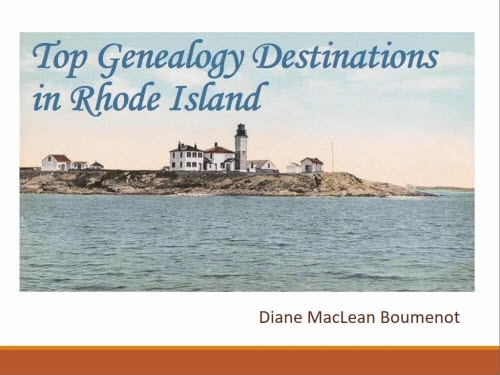 I was lucky that a well known Massachusetts genealogist was in the library that day, and helped me find all available resources for Sarah’s death, newspaper, probate, or church records. Nothing was found, which was pretty much what I expected since I didn’t find it in the cities and towns I visited. But I should stress that there is a helpful library staff who would also have been happy to help. This is not a place where the staff are stand-offish; they were very nice. The Barber Collection of Vital Records didn’t help me much. 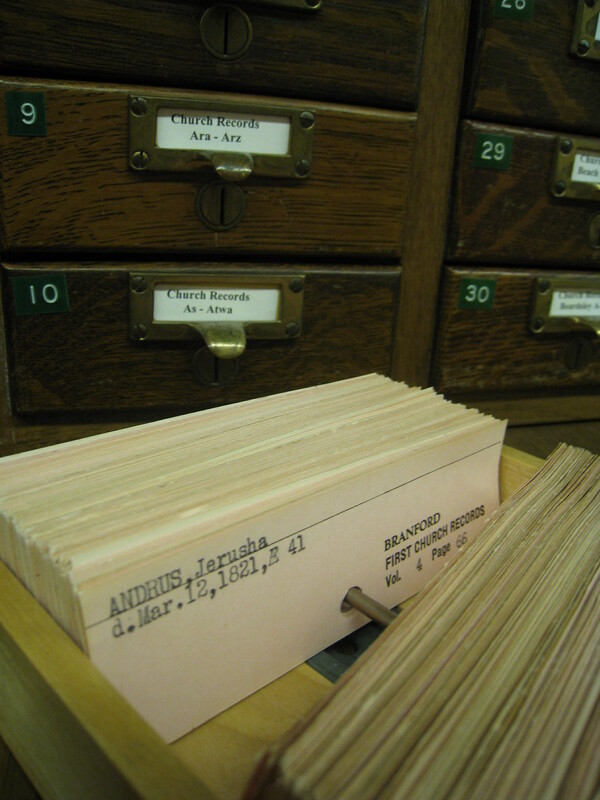 I have consulted it before online, but it was fun to use the card index in person. There are several rows of newspaper microfilm in a back room. 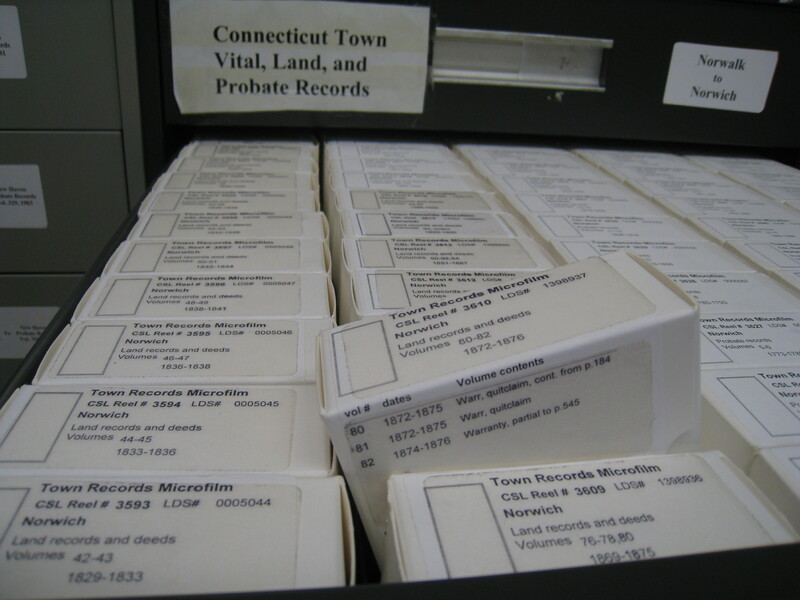 The collection of Connecticut newspapers on microfilm was very impressive. In the Hale newspaper index I did find a second, repeated death notice for another gggg-grandmother, Lydia (Miner) Lamphere, 1849, Norwich. I had obtained one from the Norwich Courier previously; this one was in the Norwich Bulletin, January, 1849. 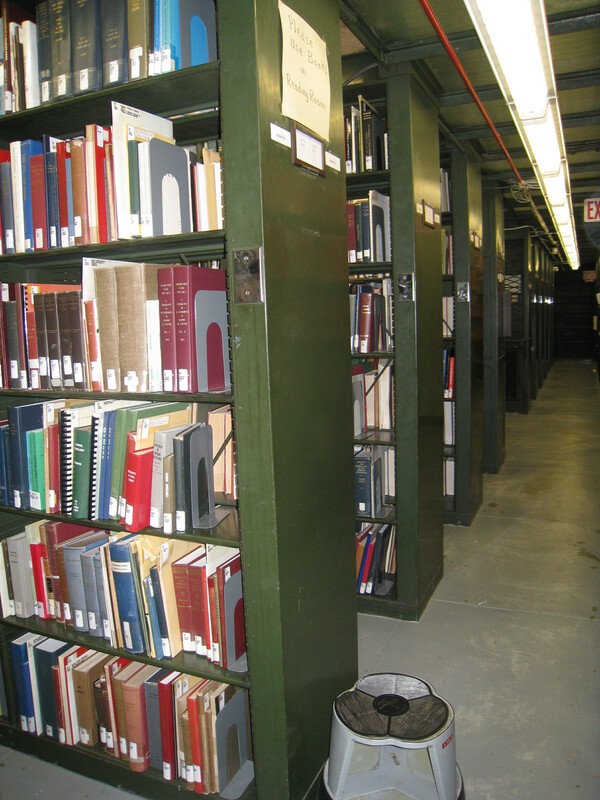 The book stacks contained town books, family genealogies, and related books and journals. In the stacks, I looked for volumes on the local areas where the Andrews lived – Ashford, Eastford, and Norwich. I also explored some typewritten and published books on various family names. The collection was quite good and I found one or two items that were new to me. 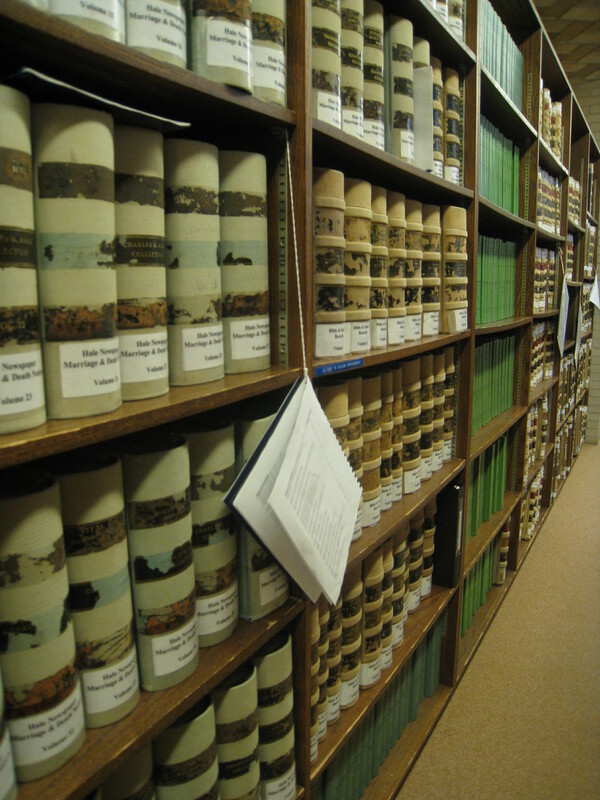 The Hale Cemetery index is not just a card file, but also consists of bound books where the cemeteries are presented section by section. I found the section of Yantic Cemetery, Norwich, where some my Lamphere ggg-grandparents were buried, and some nearby sections with other relatives. I took pictures of all those pages. The microfilm (here, of local town records including vital, probate and land) was neatly and clearly labelled. I looked through some town records on microfilm for Sarah’s death. No luck. My large Galaxy Note 2 cell phone doubles as a small tablet in libraries. I access Evernote for my research notes and to-do’s, my tree on Ancestry, any of my documents stored on Dropbox, and even take pictures in a pinch. My daughters call it the “genealogy phone.” That’s not meant to be a compliment. I always enjoy looking through the random materials collected in the Vertical Files. I didn’t find much. It wasn’t all that busy in the library that day, and I decided to ask the librarian about a question I have had for a long time – whether there could be any papers from the office of U.S. Representative John Turner Wait (1811-1899) in an archive somewhere. 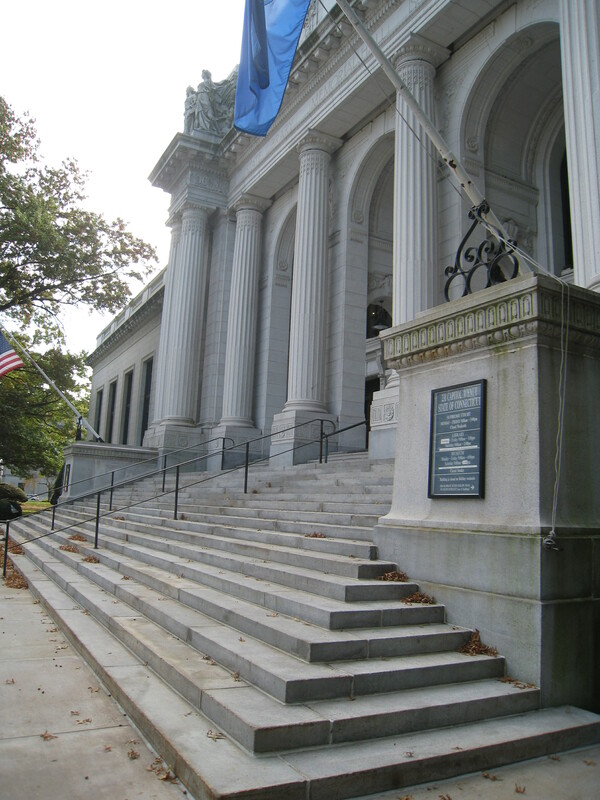 He had a perfect resource for that – a volume called “A Guide to Research Collections of Former Members of the House of Representatives 1789-1987.” John Turner Wait’s entry indicated that the Connecticut Historical Society had two letters and another set of correspondence with one individual. None of that looked like it could possibly explain his relationship with my ggg-grandfather Russell Lamphere. The librarian suggested I try his probate record, since obviously papers could have remained in private hands, and he helped me find the record. The probate record was pretty revealing about his relationships with his two daughters and their husbands. He did not specifically mention his papers, and the contents and furnishings of his law library seemed to go to a partner. The mystery continues. I recorded the names for future reference. 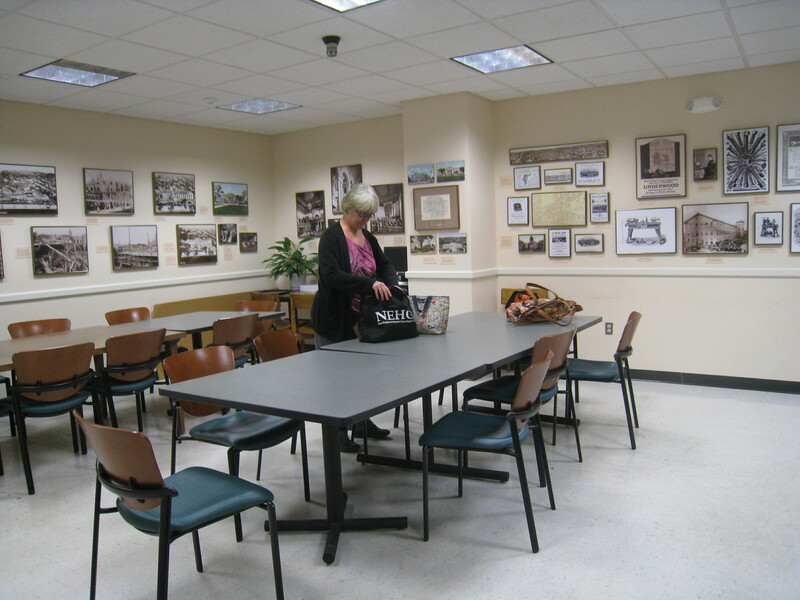 My friend Barbara and I brought our lunches and ate in the lunchroom. The last thing I did was look at the 1861 city directory entry on microfilm where Sarah Andrews is mentioned for the last time. 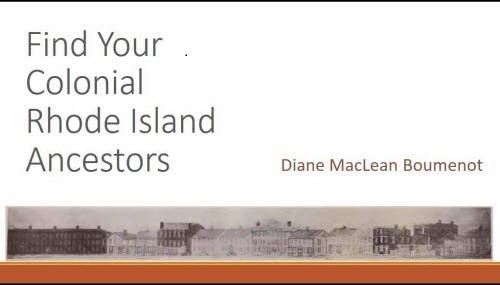 Although I had seen the directories online at Ancestry.com, I noticed, this time, a useful map at the beginning of the book, and that the book was called “number 1” which explains why I have never found one prior to 1861. She does not appear from 1862 on. Stedman’s Directory of the City and Town of Norwich. 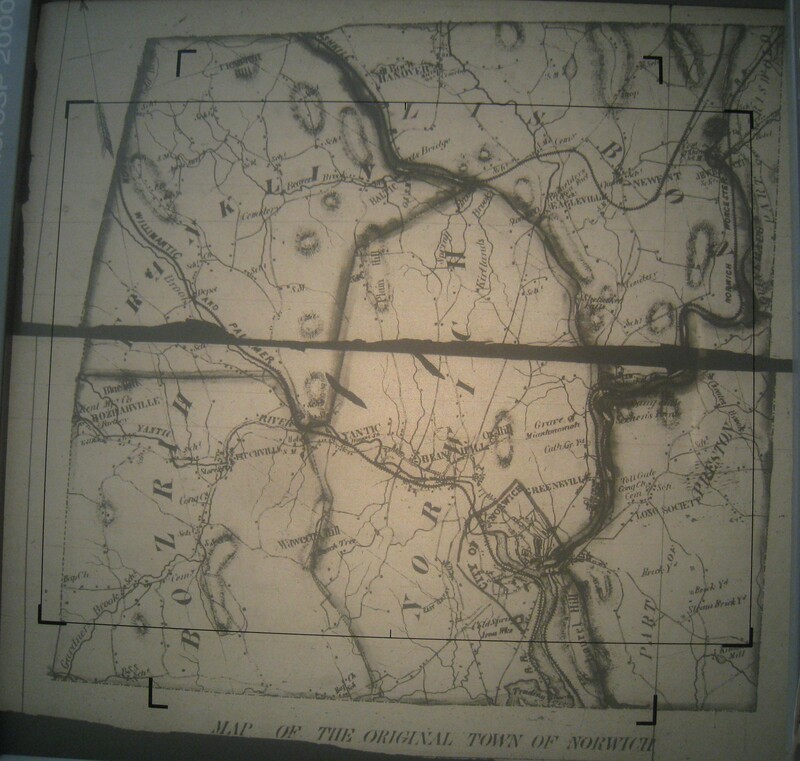 Norwich, Conn., 1861. (no. 1) Page 1: map of the Original Town of Norwich. Map should enlarge if clicked or opened. Photograph from microfilm reader. There was far more at the library/archives than I was able to explore in one day. I always find that subsequent visits and questions are helpful. All in all, an interesting trip, but I fear that Sarah’s death is unrecorded, so I will not be able to find her maiden name that way. 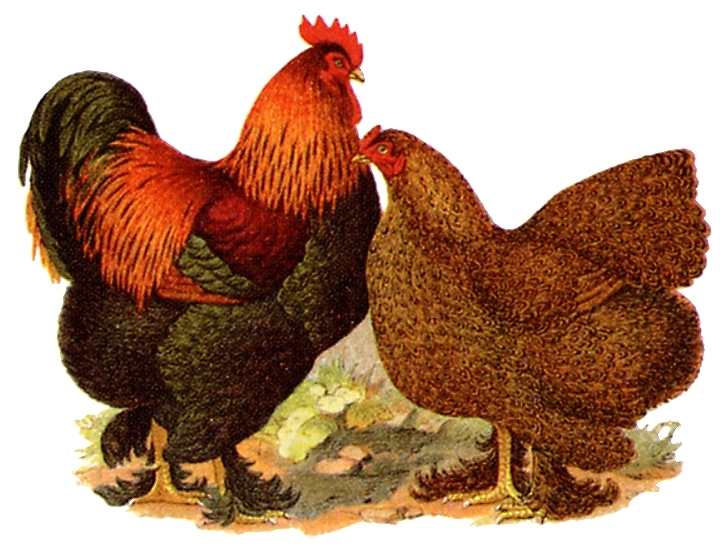 On to other Andrews strategies … one involves a chicken thief. I have visited this Library three times and found the staff incredibly helpful. I will never forget the day I registered to access the collection of manuscripts and rare books and spent the day reading the original 17th century registers of Stonington town records. Their map collection is really amazing as well. Sounds very cool, Ann. Thanks! Wow what a wonderful library, Diane! So much research, and still no maiden name for Sarah! 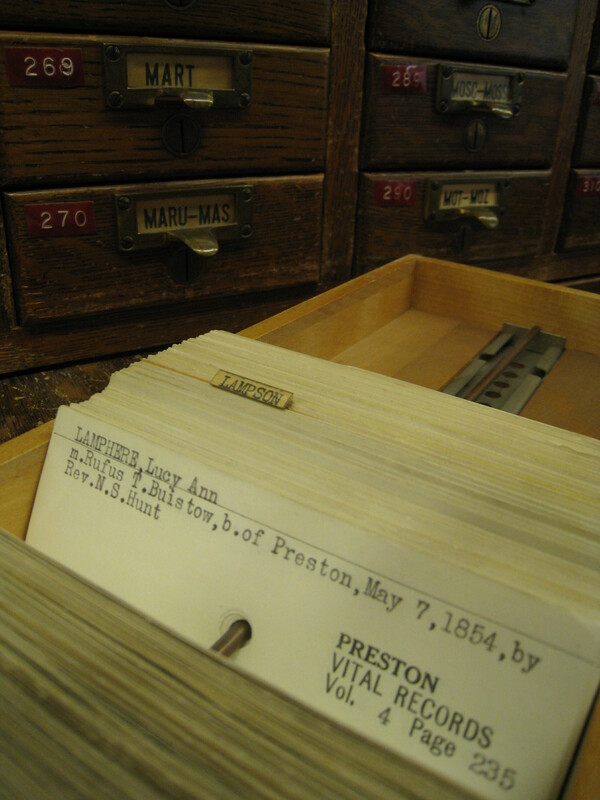 I loved the card catalogue – my favourite form of digging in person! And what’s this about a chicken thief -?? Thanks for sharing your visit to this library. Thanks Celia. I wonder where this search will take me next?